New Zealand holds a rather special status in that it was notably the first country to introduce a system of land-value taxation for raising revenue. This essay, by Ian Hopton, traces the fortunes of Land-Value Taxation (LVT) in New Zealand from its beginnings in 1849, some 30 years before Henry George published Progress and Poverty, to its final abandonment in the 1980s. LVT was introduced under the governorship of Sir George Grey, who had an understanding of Ricardo’s Law of Rent. LVT was adopted initially at local level, with the consent of settlers, who were able to exercise their choice through a popular poll. They recognised that under this system they were not penalised for making improvements to their property. The poll sustained the tax for more than 130 years until it was removed in 1988 by government decree. In the 1870s the government, no longer able to rely on customs and excise duties and the sale of land, turned to property taxes, for which the land-value tax was proposed by the Liberals but opposed by the National party. The ensuing struggle for a national land-value tax lasted from 1878 to 1896, but it was not until 1912 that a full LVT was achieved – at the height of the worldwide Georgist movement. But perhaps this was also the high point of the LVT story in New Zealand for, although initially successful, by 1922 the national land tax yielded only ten percent of the budget. Thereafter it was constantly degraded through deliberate government policies, which reduced the yield over the years to negligible levels before being rescinded in 1991. On the other hand the local rating system based on land values flourished, being sustained through the democratic choice of the taxpayers. It was an undoubted success. Support for this system increased so that by 1982 land value rating had been adopted by the majority of municipalities. How was all this lost within a few short years afterwards? The essay goes on to explain the political machinations. As with the national tax it was also the government that brought the local tax to an end, basically for ideological reasons. The leading figure in the train of events was the new Minister of Finance, Roger Douglas, an erstwhile socialist who became an advocate of the neo-liberal policies of the Reagan-Thatcher era, currently in vogue. Douglas came to power in 1984 when New Zealand was undergoing a severe economic crisis and his extreme solutions created many casualties, including LVT which was dealt a body blow in 1988 when the right of taxpayers to determine their rating system by poll was withdrawn. Thus, in New Zealand, within a few years in the 1980s, 95 years of national LVT and 133 years of local LVT was lost or severely diminished. The essay is an attempt to find out why that happened. You can read the full essay here. 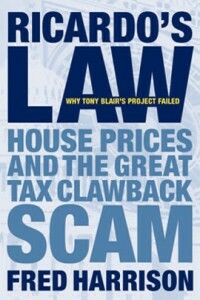 Also further general information on LVT can be found on the website: Land Value Tax Guide. PreviousRent Unmasked – A book for the people?